I never really took local history for granted – it always interested me. This is old frontier land – French and Indian war sites, Iroquois Confederacy land, War of 1812 incidents and a hot-bed of abolitionist sentiments later on. We have the Erie Canal, too. Two things I did take for granted – the abundance of green and blue as in lots of agriculture and, most especially along the lake, orchards; the other was cobblestone houses. This cobblestone home is found facing Lake Ontario, and was built in 1832 by Captain Horatio Nelson Throop. It was one of the last stops on the Underground Railroad before Capt. Throop took his special passengers on to Canada. Along the ancient lake bed is an east-west highway once no more than an Indian trail. We call it Ridge Road for hundreds of miles. 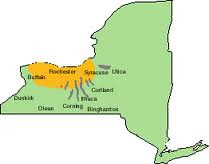 In an area of New York state, mostly within ninety miles east and west of the city of Rochester are the majority of buildings known as Cobblestone buildings found across the northeast/great lakes basin. If you are thinking of cobbles –the uneven stones or brick like stones used to make streets in many old towns and cities, here and abroad, you are only close. Cobbles in my neck of the woods are smooth round rocks that fit nicely in your hand. Big, heavy and smooth and come in a variety of colors of grays, tans and the occasion brownish red. Cobblestones are unique in this area as they are the remnants of glacier activity. The same kind of round rocks we still see along Lake Ontario’s shore are often found far ‘inland’ because they weren’t caused by the action of water but by the movement of our visiting glacier. A cobble. When you find one of these buried in the soil, you know it spent a long time rolling along under an ice sheet! Stone masons came to love these stones for buildings and created hundreds of them (an estimated 1200 across upstate New York). These cobbles were free, of course, for the picking. And anyone who has gardened, cleared land and garden for agriculture knows that rock-picking is part of the progress. Clever and impressive use of these stones made building with cobblestone a type of folk art throughout part of the 19th century. A sample of our local 'natural stone' - straight from a quarry - pure limestone. While researching a very unique village along the lake shore for some history posts and a possible fiction series in the future, I settled on this post about cobblestones because I was struck again by the loveliness of these homes and what a treasure they are in the county I grew up in. Stone houses are not unique to upstate NY but this style of using cobbles is a bit different than houses found elsewhere. Many local artisans moved on west along the Great Lakes and created cobblestone houses along the way. Have you anything similar where you live? Oh, Deb, I love rocks so this particularly interested me. Your cobbles are beautiful. the look like river rocks, which are also beaten and shaped by glacier water. The limestone is gorgeous. My island is affectionately known as "the rock" and our soil is quite rocky. It's not unusual to find large sharp rocks in any amount of dirt when we try to plant something. I live on the edge of a long skinny north/south lake carved out of the limestone by the glacier and its melting rivers. My soil here is so rocky, I plant with a pick axe! I used to live near the ancient lake bed and we had top notch loamy soil. Still had a fair share of rocks but much less quantity. the whole glacier thing fascinates me -- and provided this lovely view I live with! I love rock/stone houses. Around here we don't call them cobblestones, we call them river rock, and they come in all sorts of lovely colors. Just down the road a few miles we have a neighbor with an art gallery housed in a tiny stone house with an arched doorway. I covet it! Do you suppose the term "cobbled together" and cobblestones are related? Just guessing, but I'm thinking "cobbled together" probably has more to do with the shoemaking kind of cobbling. But I can't say for sure. It would be interesting to know. cobbled together means thrown together hastily --I am not sure I knew that so I've probably never used the phrase OR i've used it incorrectly! Cobblestone houses would not have been built in haste but whether the phrase originated with shoes or streets.... good question.